LSBU's labs feature the latest computer and experimental equipment. 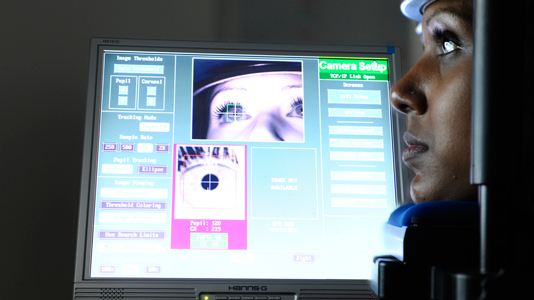 Psychology students benefit from strong practical facilities to conduct scientific testing. The division's laboratory complex contains the latest computer and experimental equipment and has its own dedicated reference library. This pair of large rooms has been set up to provide a comfortable environment for conducting observational work with the option of discrete observations via a large one-way mirror. The mirror allows the whole room to be clearly seen from the adjoining observation area and is ideal for research in areas such as developmental psychology where the presence of the experimenter may influence a child's behaviour. The division currently possesses three Biopac base units and a range of different specialist modules or the collection of psycho-physiological data. The apparatus allows collection of a wide range of physiological data including: Impedance cardiography (ICG); Electro dermal activity (EDA); Electro myogram (EMG); Skin conductance response (SCR); Continuous blood pressure monitoring; Electro cardiography (ECG); Respiratory rate, etc. The laboratory currently has a desk mounted SR eye tracker and is shortly acquiring a head mounted portable eye tracker for dynamic data collection. We are able to support a wide range of experimental paradigms with the apparatus including incorporation of other physiological data from apparatus such as Biopac. The laboratory currently carries around 1500 different psychometric tests across a wide range of application areas including clinical assessment, personality, neuro-psychological testing, cognitive performance and diagnostic screening. We currently have three dedicated psychology computer labs and a large number of testing cubicles all equipped with PCs running a range of experimental applications. These include: Super Lab, E-prime, Experiment builder, Nudist, The Observer, Acqknowledge, In vivo, SPSS, Cog Lab and MPlus. SPSS is an industry-strength software package for the statistical analysis of data. It is used by market researchers, health researchers, survey companies, government, education researchers, marketing organisations and academia. This facility has been set up to examine various aspects of drinking behaviour in an ecologically sensitive environment. The labs also include seminar rooms, a workshop, storage areas, a preparation area and a laboratory office. There are two drop-in sessions per day for students to access technical and learning support from our highly professional technicians who are on hand to help. We use a web-based software package to advertise experiments and issue credit(s) for the departmental Research Participation Scheme (RPS). The experiment management system offers an easy way for participants from across the University to sign up for studies. This software helps to increase awareness and participation in our studies, therefore increasing the reliability of our experiments.